Chance has it that if you live in the United States right now, you’ve been experiencing some chilly weather! Last week, I woke up to find my car windows covered in a layer of ice; and of course, I had no ice removal items on hand. So, naturally, I came up with this magical ice remover to help me out! If you live in a place that experiences frequent cold snaps, it’s always a good idea to stay prepared. 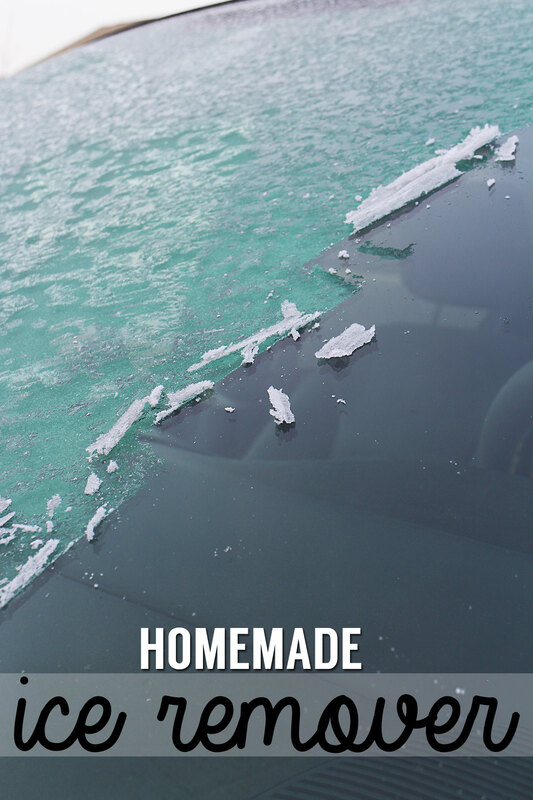 If you’re anything like me and can never seem to find something to remove ice from your car windows, this spray is a great thing to keep on hand. Ours stays under the kitchen sink with the other cleaning supplies. Magical is definitely the right word! I’d no idea that water and vinegar could melt ice. Thanks for sharing this! No problem – I hope it saves you a lot of time and trouble this season! I have never heard of this, but SO good to know!! I’m always sitting in the car waiting for the ice to melt! It’s the worst isn’t it?! Living in MN this tip is great, thank you for sharing! I just bought a gallon of vinegar so this will be project #2 on my vinegar concoctions list! I love vinegar … use it for everything! What a great idea! Thanks for linking it up at our Found & Foraged Linky party! Hope to see you next week. Well, this one will be a good one to remember! thank you! I have heard this may cause pitting in the glass, as well as the paint. Have you seen any evidence of this? I haven’t at all; some of the research I did suggested that as long as you don’t leave vinegar on for long periods it shouldn’t do harm. If I keep a bottle in my car will it freeze? It depends on how cold it is where you are. Vinegar requires a colder temperature to freeze, but it will freeze. I have also heard you can add alcohol to lower the freezing point even more, but I haven’t tried it yet. I’m planning on testing it out during our upcoming cold burst.